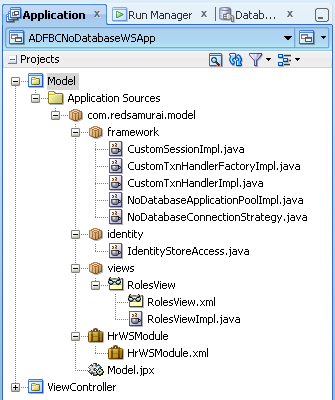 There is very good sample application from Steve Muench - #147 ADFBC Application With No Database Connection (not yet documented). I was using it to implement recent request from the project, its why I would like to document it. 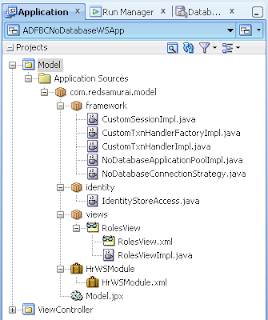 We had a discussion with SOA developers and they were wondering if its possible to run ADF BC application, without DB access. This is quite common use case in SOA projects, there is no direct access to DB and we need to consume data through Web Service layer, as for example. Yes its possible and I see quite strong advantage of ADF BC, even when working with non DB data sources - its easy to centralize data access through programmatic VO's, its fast to expose programmatic VO through Data Control and finally is easy to capture user data input, use out of the box functions to process user data (getting current row from VO, iterating over row set, creating new rows, deleting rows, etc.). 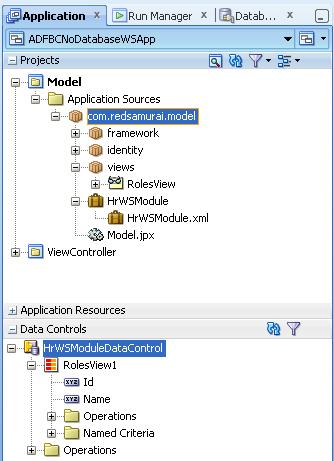 This can be as alternative for Web Service Data Control. 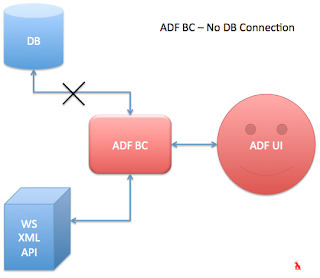 ADF BC application is disabled from creating database connection, instead it contains programmatic VO to retrieve data from alternate data source. In this case, application runs independently of database and we still can use all powerful ADF BC data processing features. How can we add viewcriteria to such programmaticVO ? Does this support pagination on af:table scroll ? Nope. Pagination is coming with the new ADF release. You are very right in mentioning that in a SOA landscape, clients expect the applications (ADF-BC in this case) to be based on Webservices, and all the CRUD operations happen through services and zero db connectivity. In such case, I see that most of the performance tuning to be done at the web service layer, as BC4J gets very much light-weight with not Connection/data source worries. From your experience, Could you pls suggest what performance measures to be taken from ADF (Binding + BC4J layers) perspective? Does this implementation supports Query? 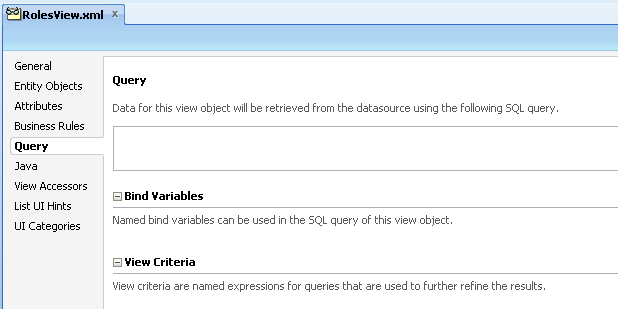 I mean like ADF Query component, where you could search some fields and display it in the table. 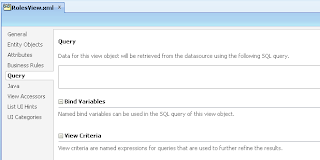 I know this can be done using EBJ or with usual data binding(with database). Just looking for your approach if this can be done, as I found it the most easiest in my case/requirements. 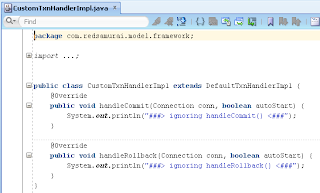 This should be possible, you could define View Criteria and catch parameter in executeQuery method in View Impl class. Can Sample be ported to 11.1.1.4? I get deployment error. 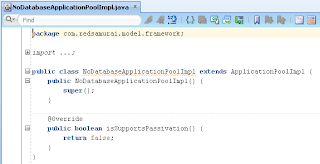 weblogic.descriptor.BeanAlreadyExistsException: Bean already exists: "weblogic.j2ee.descriptor.wl.SecurityRoleAssignmentBeanImpl@57d2982a(/SecurityRoleAssignments[valid-users])"
It could be, JDEV corrupts ADF config files. I assume it should work, but I don't have version 11.1.1.4 installed anymore to test. 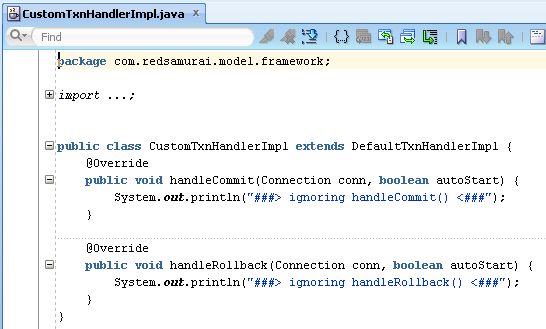 Hi, i have tried this application in jdeveloper version 11.1.1.6.0 and 11.1.2.0.0 but its not supporting...so in which version this applicatio works? 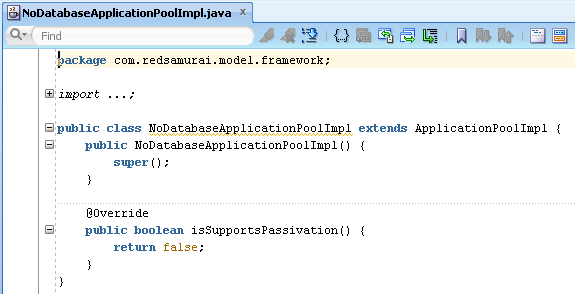 It was implemented with 11.1.2.4, but you could implement the same functionality with any ADF version, it will work. 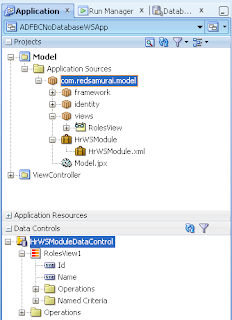 Can we have one more Application Module with Data source connection provided, and fetching the data from local DB, displaying it in same UI page, i.e., just below the roles table. I have a scenario, where some data of page is displayed with DB connection less AM and some page data using Data Source connection in AM. I am facing issue in rendering data in this case. If we remove the connections then how the PS_TXN information is managed? Can we store the information in File system? You can tune AM pool to avoid passivations/activations. PS_TXN will not be needed in such case. Does this work on clustered on environment ? I have the same use case and i have implemented as per this approach and it works absolutely fine without any issues.Wanna know whether this works on clustered on environment ?